After book one, I enjoyed the series and writing style enough to pick up this book. I'm glad I did because I ended up really enjoying it! I am back with another book review, The Dream Thieves by Maggie Stiefvater. 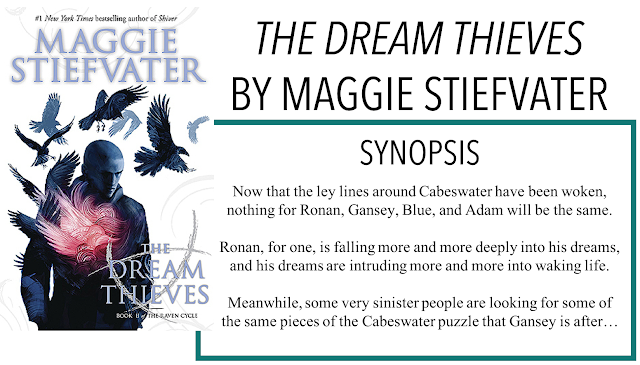 This story picks up pretty much where book one left off, except this story focuses more on Ronan and his backstory (which became important in book one). As with the first book, they are still looking for Glendower but that seems to take a bit of a backseat to some more pressing concerns in this book. Also, like the first book, there is a strang outsider figure who is presumably the one who will create the conflict at the end. I won't say too much more because I don't want to spoil anything. First of all, I'm really enjoying Stiefvater's writing style. She does a great job of creating a story and characters that are not only well-written but beautifully written as well. The few romance snippet scenes that we get peppered throughout the story are marvelous and the rest of the story is really nicely written as well. I know Stiefvater's writing style can be off-putting for some but I know I'm really liking it. The storyline itself was good - after the first book, I wasn't sure what would happen during the in between books. It's kind of weird reading the series now, after all four books have been published, knowing that this series has an end but that there are now two more books between now and that end. I'm trying to come up with mini-conflicts that Stiefvater might sprinkle throughout the books to lead up to the grand finale. In this sense, I'm almost getting a Percy Jackson-esque vibe, where there are quests along the way to the end of the series. It's not a bad thing, just something interesting I've picked up on. Overall, I'm looking forward to continuing this series and seeing where things go!